After a tough season in which Mark Richt's seat got even hotter Georgia's hoping to gain entry to the Top 25. Sophomore quarterback Aaron Murray had a decent year as a freshmen and hopes to improve even more in his second year as a starter. 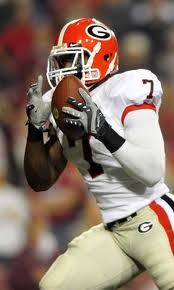 He'll miss his best wide out in A.J. Green a lot but he still has other options also. 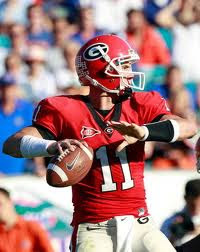 If Murray struggles then sophomore Hutson Mason will gain the starting slot. The backfield may be the best since the squad had Knowshon Moreno. Backs Caleb King and Washaun Ealey are good players and will be asked to carry the ball a lot this season. Junior Carlton Thomas may also gain some carries. Options for Murray include Tavarres King and Logan Gray. Tight end Orson Charles is an All-SEC Selection last season as a sophomore and hopes to continue it in his third year. The offensive line lost its best player in guard Clint Boling. Back though is center Ben Jones and guard Cordy Glenn. The defense also lost much talent with linebacker/end Justin Houston but the front seven is still decent. Junior Abry Jones and nose tackle DeAngelo Tyson stomp up back after back. Without Houston the linebacker core has Cornelius Washington and Christian Robinson. The secondary is the best unit on defense with all four starters returning including Brandon Boykin and senior Jakar Hamilton. The special teams is one of the better in the SEC with kicker Blair Walsh and senior punter Drew Butler.